Rolling builds does not seem to cancel branch builds. 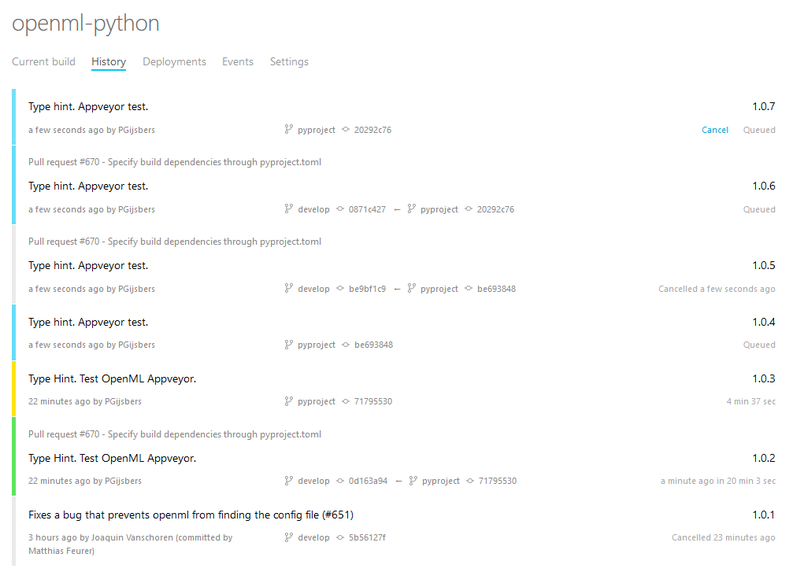 We have set up CI on Windows for our repository. However, when subsequent commits are pushed to a PR, we want any queued and running tests on that PR to be cancelled (and the most recent ones to be started). To clarify, from the screenshot, I would have expected build 1.0.4 to be cancelled automatically as 1.0.7 supersedes it. Build 1.0.5 correctly got cancelled because of 1.0.6. In our project settings, we have `rolling builds` enabled, `Do not cancel running builds` disabled and tried to have `Only for Pull Requests` enabled and disabled. The repository also contains an appveyor.yaml file. For some reason it seems to be working now. Maybe it just took some time. This can be closed. Owen McDonnell closed this discussion on 15 Apr, 2019 03:30 PM.